In the darkness we sense the figures of the five performers who appear to be sitting on a beach and making small movements under the rising sun. The lighting suggests the slow awakening of the day, yet this quietness is in contrast with what is about to come. 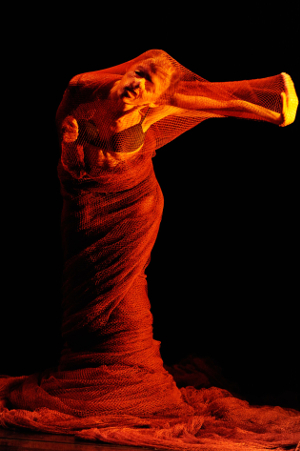 The performance will move between very different registers, from the oppressive anguish of a fish trapped in the nets to the spirited conversation which accompanies the task at hand, also touching upon the different life stages and working activities of the Basque women who mended fishing nets ('rederas'). Sareak is a contemporary dance performance which transports us to the emotional, sonorous, expressive and even assertive world of this collection of women. Throughout the performance, the focal point of their activities, the fishing nets, takes on a physical presence which is evident in the setting. “Sareak is an homage to the labours of these women”, explained Natalia Monge, a lecturer from the Department for Didactics and Musical, Plastic and Corporal Expression at UPV/EHU and the director of this performance. “Their work gained scant recognition, but at the same it was crucial to the history of our fishing industry. I felt that so little had been said about them, about the precarious nature and yet the absolute indispensability of their labours, but also about many other aspects of their daily lives”. This production is filled with ironies and contradictions, leaving very few elements unexplored. The performance took place on 21 and 22 September in Kultur Leioa and was also represented at the BAD (Bilbao Festival of Theatre and Contemporary Dance) in October. The production was prepared during three intense months of research, creative endeavours, and rehearsals, and this is not the first project. The company Organik has produced other contemporary dance performances inspired by different elements of the Basque imagination, such as Irrintzi, Txapeldun, and Carneros. “I always begin from a curiosity that I have”, Natalia explained, “and these latest creations have been linked to an iconic element of Basque culture, in this case, the women who mended the fishing nets”. The research process included a preliminary stage which was in keeping with any other type of investigation, consisting of a study of the existing documentation which also included audiovisual and graphic documents. “Next, as the director of the work, I approached different fishing communities to establish a first point of contact before then working together with the musical composer to create the soundtrack that is the inspiration for the performance. We conducted many informal interviews in different ports and we also filmed interviews with the women as they worked on the nets in Ondarroa”. Some of the direct quotations from these maritime workers can be heard throughout the performance. The piece was produced with the backing of several public subsidies from the Basque Government (dance productions and company consolidation) and the support of Pyrenart, a regional development project funded by the European Union. In addition to Natalia working as the director, a further two people assisted in the direction process, in addition to five performers, a musical composer who created the original musical score, a lighting technician, a graphic designer, a video artist, a wardrobe designer and one other person who assisted with the management of the company. “Many different professionals have to work together in order to ensure that each of these performances assumes the form that the audience ultimately sees on stage”, Natalia added. Natalia’s activities as a director with Sareak are part of a project of knowledge transference processed by Euskoiker. In this way, Natalia has been able to create a connection between the professional world of the stage and her work as a member of the teaching staff at UPV/EHU. “The topic that I am teaching now, ‘Physical Education and its Didactic Approach’, includes a series of contents titled ‘Corporal Expression and Communication’”, Natalia explained. ‘The majority of the teaching staff working with the topic of Physical Education in the Primary stage have more of a background in sports. In my case, I am familiar with the world of sports but I have also been directly involved in working with projects using corporal expression in a dance company, and so I feel that this provides a broader approach to the topic. I invite my students to look inward and to explore values linked to the expression of feelings and emotions and to self-confidence and a lack of inhibitions, thus strengthening their ability to be creative through their body. This is a very different perspective from that of the sporting world, which normally takes a much more functional approach to the body”. Work with the body goes far beyond sports and dance and allows us to work with both basic and transversal skills. “It is important for me to help my students to understand that creativity is a fundamental aspect of education and that the body provides a wealth of possibilities”, Natalia told us. “In this way, our work takes on a far more interdisciplinary approach. How can we work with maths or science using our bodies? There are fascinating proposals involving the discovery of a new place from which to work, and this begins from the search for differing responses. This is to say that we do not seek one single response to our proposal, but rather a series of potential responses. We apply this projection to educational environments, where boys and girls are able to create and to make decisions freely, whether on their own or as part of a group, and we encourage social activity". It is interesting to note that there are many similarities between the methodological approaches of both areas. “In a creative dance process, we are reluctant to tell dancers how they should move”, explained Natalia. “We simply give them ideas so that they can explore the thoughts of their bodies and in this way find the resources for movement in a very liberated manner. The pedagogical approach in educational environments would be very similar: to provide a framework for boys and girls to search, explore and discover responses. I believe that this corporal approach helps students to break the routine of being seated for so many hours, therefore enabling them to release tension, channel stress, improve social interactions and develop their creative capacity”. We can see that the experience that Natalia has acquired in the world of performing arts has had a direct application in her university teaching at the Faculty of Education. Here, she seeks to explore the expressive and communicative possibilities of the body and to examine aspects relating to self-knowledge and socialisation, with both of these topics playing an essential role in the educational environment.